Spotify is pretty amazing - not the free version (I think I still prefer Pandora radio for that) - it has to be the paid version to really get the full effect. It has figuratively opened my mind to music that I never before would have considered (and some I will continue to deride). Although I still tend to stay within the confines of classic rock mixed with more modern indie and alternative rock, I have certainly explored and expanded more this past year than before. The biggest undertaking I accomplished was listening to each of the 500 albums listed in the Rolling Stone's 500 Greatest Albums of All Time (the May 2012 updated list, many, but not all are available on Spotify). Although I don't have an exact count, I have listened to well over 600 albums this year. When I think about it, I don't know how many albums I listened to before this year, but it couldn't have been a ton more than that. I decided to rank my favorite albums of 2013, and when I say rank, I mean it has to involve some form of measurement. I find it very difficult to make "top-x lists," and am often very critical of such lists. One thing that drives me crazy is when radio stations have marathons over some holiday weekend of the "top 100 songs of all time, as voted by you, the listener!" When it is actually "We let you, the listener, go to our website and pick 5 songs from our catalog (I'm not sure who actually does this, but it couldn't possibly be representative of the actual listening audience, or am I wrong? ), which is limited to 'classic' rock of the 60s, 70s, and maybe 80s." You then end up with weird things like Boz Scaggs' "Lido Shuffle" being ranked higher than Fleetwood Mac's "Go Your Own Way." While I can't promise that I won't have infuriating choices, I can at least be upfront about the rules I am playing by. Rules which are: I am limiting my list to the top albums of 2013 that I personally have listened to at least twice (with one exception). There are a couple albums that in doing my research for 2013 that I decided to give a listen to, but they left imprints on my ears too late in the game to be included. That's really about it, If I don't discuss an album from 2013 that should be on this list, you can safely assume I simply haven't come across it yet. I started by listing all the albums I could remember having listened to over the past year, and followed it up by looking up albums released in 2013 (A quick side note - Buckethead released released 33 albums in 2013! ...and I didn't listen to a single one). After compiling the list I had about 20 albums that I had listened to extensively, which doesn't seem like a ton. I probably am not really qualified to write a "top list of" like you would read on a reputable website, but we can carry on understanding the shortcomings of the rules I set. Now that I have a list, I need to find the appropriate order. It is tempting to create some model involving metrics like number of times I listened to each album, number of sales, chart ranking, twitter mentions, Metacritic rankings, etc. Creating such a model really wouldn't get at the heart of what I really want to accomplish. While music preference is very much a personal subjective matter, I can certainly objectively say that I'd rather listen to one album over another. Of course my preference might change over time, and others will certainly have their own opinions, I hope to give a snapshot of what I connected with this past year, and what I think others might appreciate. I only listened to Yeezus once and included it so that every album I do like would get at least one vote. I listened to some of Kanye's other albums that are on the RS's 500 Greatest Albums, and I just didn't get them. This album in my estimation probably ranks much higher than College Dropout, but Late Registration is more listenable. Elvis Costello and The Roots - Wise Up Ghost Wasn't a fan, I really didn't like a lot of Costello's stuff in the RS's 500 either. The Flaming Lips are one of those bands that I would hear a song of theris here or there over the years, but I didn't really fully appreciate them until earlier this year. Yoshimi Battles the Pink Robots might be their magnum opus, but this simply is a beautiful album. Existential lyrics with haunting psychadelic landscapes reminiscent of some early Pink Floyd. This album wasn't written to release singles, but rather is a work of art as a whole. One of those albums that I kept seeing critics praise, to which I add my own. I have listened to my fair share of The Beatles, both in and out of their experimental phase, but there really isn't a lot of psychedelic rock that gets played on classic rock/oldies stations. It wasn't until I heard more of The Kinks, Jefferson Airplane, among others, that I really gained an appreciation for that sound, and this is a great album for anyone looking to combine modern indie rock with those psychedelic influences. The influences, however, aren't limited to the San Franciscan sound, but also include the likes of The Rolling Stones and The Velvet Underground, almost as if a snapshot of those bands in the late 60s was being channeled. At times the album is humorous, at others pensive, but never lacking of interest. Perhaps the biggest disappointment of all albums released in 2013, if only because of the lofty expectations. Of course that is an exaggerated statement, but I was disappointed, even though it is a great album from a great band. We already had Daft Punk writing music that made us simultaneously want to ponder our existence and get down and dance, and Franz Ferdinand fills the void of indie club rock. Whatever, it isn't up to me to dictate the direction Win Butler and co. should take. 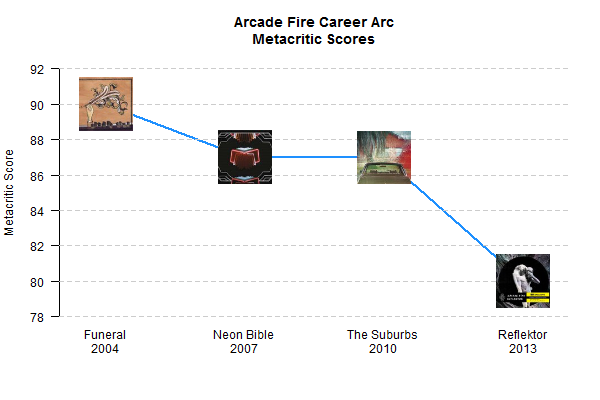 I would rate Funeral as one of my all-time favorites, while Neon Bible and The Suburbs are amazing in their own right. I do love the "Black Orpheus" references of the album, and anything with David Bowie (even for just one song) isn't bad. I looked up this album after having heard the single "Come a Little Closer" on the radio. I did enjoy their first two efforts, but I would have placed Cage The Elephant a bit behind The Black Keys and whatever Jack White is working on. I really enjoyed the album, and have kept going back to it since the initial listen. The bookend tracks provide a perfect intro and resolution to the album, while between is full of great blues tinged alternative rock. Another album that I looked up after hearing the lead single, "Purple Yellow Red and Blue." Sometimes there is just something about an album that just clicks; that you connect to on some deeper level. This was one of those albums. Danger Mouse just brings a great sound to alternative rock (psychedelic rock? ), and has now produced a large number of albums that I love. Every time I listen to the album different tracks stand out, but then I realized that their song "Evil Friends" was used in a commercial currently airing, which might explain the strange desire I had the other day to visit and try their black bean and rice burritos. Before this album came out, I read some rumors that it might be their last. It appears that may not be the case, as they are supposedly talking about doing a tour next year. 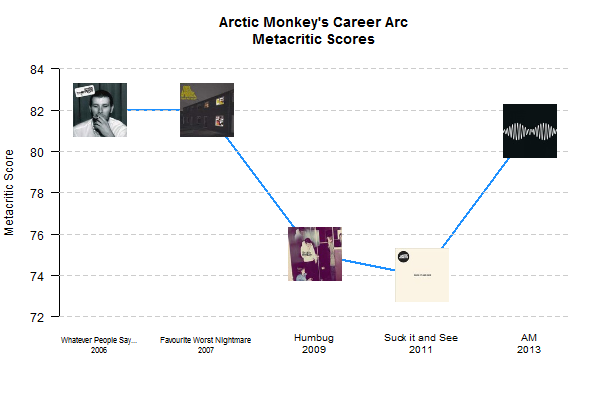 The album is not held in high regard by the critics (see below); perhaps another one of those bands whose debut is transcendent or something, resulting in subsequent releases being panned if they are simply a continuation of the debut, or derided if they venture too far from what worked. The career arc of The Strokes is an interesting one, and if you were to jump from listening to Is This It? to Comedown Machine it would be quite a surprising leap indeed. I however have listened to this album countless times, and it just might be my favorite of theirs. The synthesizer worked for The Who on Who's Next, and it works here. filler, "Call It Fate, Call It Karma" is about as great of an ending an album could hope for. Earlier this year listened to their eponymous debut quite a bit - but I didn't care as much for Contra. I think a lot of how we feel about music is a reflection of where we are in life when we first listen to it, and perhaps Contra simply did not relate well to me. Modern Vampires of the City hits the nail on the head. It not only was what I needed to hear, they removed some of the sound that I considered to be obnoxious (realizing that it was a part of their identity and was the differentiation between them and other indie rock). This is clearly a concept album with each track building on the last, yet it is still able to produce several great standalone singles. I keep coming back to this album as it never disappoints. If nothing else, it is certainly worthwhile to seek out new music. I do hope that there is something on this list that others haven't considered before that they will discover and enjoy.